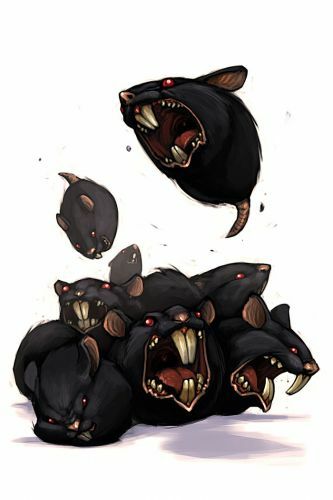 The Swarm of Pygmy Mice are a breed of mice found in the Jungle of Dread. They are known to drop Vanilla Beans as loot. Vanilla harvesters live in fear of Pygmy Mice, who terrorize anyone who tries to get near their beloved vanilla vines on the far side of the Jungle of Dread. Normally, the Pygmy Mice’s rage is confined to their territorial groves, but, like most mice, the Pygmy Swarms prefer that their favorite food be delivered in cheese form. They enjoy Gouda and SUPER|brie+, but the smell of a vanilla cheese turns them into a roiling mass of fur and teeth ready to devour your cheese stock. The Swarm of Pygmy Mice have been found to be especially attracted to Gouda, SUPER|brie+, and Vanilla Stilton cheese. Shadow traps are very effective against the Swarm of Pygmy Mice. All other power types are ineffective. The Swarm of Pygmy Mice drops the Pygmy Swarm Egg during the annual Spring Egg Hunt. 8 June 2010: The Swarm of Pygmy Mice were originally named the Pigmy Swarm Mouse. The name was changed to Swarm of Pigmy Mice with the release of MouseHunt Version 3.0. 17 August 2010: The Swarm of Pygmy Mice acquired its current spelling. 14 April 2011: The Swarm of Pygmy Mice began dropping a bonus Pygmy Swarm Egg as loot as part of the Spring Egg Hunt 2011 event. This page was last edited on 27 May 2017, at 00:33.